A fighter in the IDF’s Golani Brigade, Elhai Taharlev, was identified as the soldier murdered in the car attack this morning. 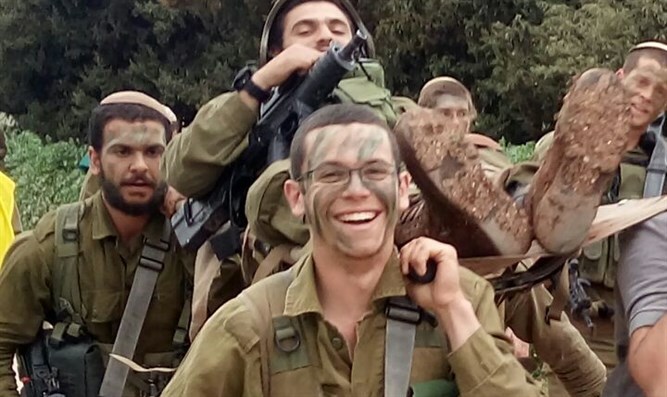 A fighter in the IDF’s Golani Brigade, Elhai Taharlev, 20, from the community of Talmon in the western Binyamin region has been identified as the soldier who was murdered this morning, Thursday in a car-ramming attack at the Ofra junction. Elhai Taharlev studied at the Mekor Hayim yeshiva high school in Kfar Etzion in Judea and, afterward, at the hesder yeshiva in Tekoa in the region. He is survived by his parents, three brothers and three sisters. Elhai's father, Rabbi Ohad Taharlev, heads Midreshet Lindenbaum for Women in Jerusalem, one of the educational institutions of the Ohr Torah network founded by Rabbi Shlomo Riskin.. The Talmon community in which Elhai lived said in response: "On the eve of the Passover holiday, the Taharlev family and, with them, the residents of the Talmon community received the tragic news. Our dear Elhai was murdered. A talented youth, modest, and very, very beloved. The pain breaks the hearts of friends, neighbors, kids in the youth group and all the members of the community who knew Elhai and loved him." "This is the third neighbor we are losing: Roi Arbel, father of 5; Gil-ad Shaar (who also studied at Mekor Chaim yeshiva and was one of the three boys kidnapped and murdered on their way home three years ago, ed.) and now Elhai, were taken from us by evil human beings. Spring won't bring comfort to this great pain. We embrace the family, and we ask the Creator of the Universe to put an end to our sorrows." "We believe that we can overcome our enemies, and that we will."